COLOMBIAN PRESIDENT JUAN Manuel Santos has said he is “honoured” to receive the 2017 Tipperary International Peace Award. 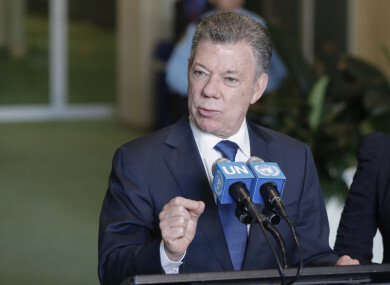 The award recognises the efforts of Santos in bringing peace to Colombia and for the agreement that put an end to more than 50 years of fighting by the FARC guerrilla army. The award will be presented to Santos at a ceremony in Tipperary later this year. The president has confirmed that he will travel to Ireland to accept the award. “As president Santos prepares to step down as president of Colombia after eight years in office, it is appropriate to recognise the president’s efforts and tremendous vision to bring peace to his country through an agreement that, after almost five years of talks, put an end to more than 50 years of fighting,” Tipperary Peace Convention honorary secretary Martin Quinn said. Responding to the news of his selection, Santos said that Ireland “has been and continues to be an inspiration for countries trying to pursue their own peace processes”. “Certainly, the success of the Northern Ireland peace process is a constant reminder of what it possible. It clearly demonstrates the dividends that a peaceful future can deliver,” Santos said. “The fact that achievements of the Colombian peace process are being acknowledged by such a prestigious award in Ireland has particular significance for Colombians. I am honoured to be able to accept the Tipperary International Peace Award on behalf of all the victims of the conflict and the many that have worked tirelessly to bring about peace in Colombia. In a statement today, Tánaiste and Minister for Foreign Affairs Simon Coveney said that Santos is an “extremely deserving recipient” of the award. “President Santos initiated the negotiations between the Colombian government and the FARC, and throughout showed remarkable courage, commitment and resolve,” Coveney said. Email “Colombian president who negotiated FARC deal to get Tipperary peace award”. Feedback on “Colombian president who negotiated FARC deal to get Tipperary peace award”.